Following Delta’s Increased Medallion Qualifying Dollars announcement and United Devaluing MileagePlus Premier Program, Alaska Airlines decided that they would revamp their 2015 Mileage Plan program as well. Similar to Delta and United, Alaska Airlines is trying to target business travelers, who they feel spend the most by offering increased mileage bonuses on full economy and first class fares. New Alaska Airlines earning chart for 2015. In addition to the new earning chart on Alaska, MileagePlan members may be in for a shock on the new earning structure on Delta operated flights. 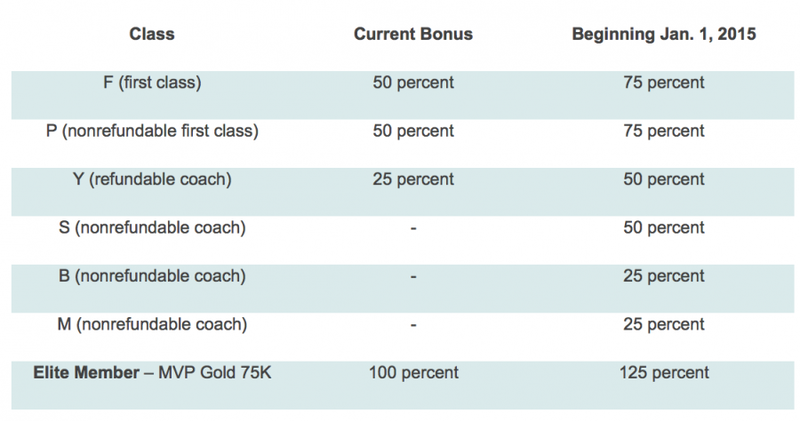 Alaska Airlines is shaking up their earning structure for 2015. Starting with the positive, Alaska Airlines MVP 75K members will now earn a 125% mileage bonus compared to the current 100% bonus that they earn currently. This is inline with what Delta gives their Diamond Medallions currently, though that will change starting next year once Delta switches to a revenue based earning structure. However, those that will be most affected are Delta fliers who credit to Alaska Airlines. Starting next year, if you are flying Delta on a their L, U, T, X, V fares (which are the most common coach fares) you’ll only be earning 50% of the mileage that you would today. Even worst, if you are on one of Delta’s basic economy E fares, you will only be earning a meager 25% of the miles flown. With this latest change to Alaska’s Mileage Plan program it may not make sense anymore for Delta fliers to credit to Alaska, especially if you fly primarily on their cheap coach fares. Delta is also making moves in the Seattle market with all their new routes, as well as their current double miles/MQM promotion to/from Seattle. It wouldn’t surprise me if these reduced mileage earnings on Delta is only the start to the end of their partnership all together. What are your thoughts on these changes to Alaska’s Mileage Plan program?